In 1991, the Outreach Council of the African Studies Association accepted a proposal from Africa Access to establish awards honoring outstanding books on Africa published or republished in the United States. The first Children’s Africana Book Awards were presented in 1992. Annually since that time awards are presented to authors and illustrators in two categories, Young Children and Older Readers. Click here for Past Winners for Older Readers. Bundle of Secrets by Mubina Hassanali and illustrated by Tony Siema (CreateSpace Independent Publishing Platform, 2013). Desmond and the Very Mean Word by Desmond Tutu and Douglas Carlton Abrams and illustrated by A.G. Ford. (Candlewick Press, 2013). The Boy Who Harnessed the Wind by William Kamkwamba and Bryan Mealer and illustrated by Elizabeth Zunon (Dial, 2012). The Matatu by Eric Walters and illustrated by Eva Campbell (Orca, 2012). Ostrich and Lark by Marilyn Nelson and illustrated by the Kuru Art Project (Boyds Mill, 2012). When I Get Older:The Story Behind Waving Flag by K’naan and Sol Guy and Illustrated by Rudy Gutierrez (Tundra,2012). 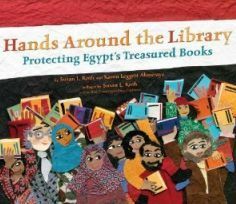 Hands Around the Library : Protecting Egypt’s Treasured Books. Susan L. Roth and Karen Leggett Abouraya (Dial Books for Young Readers, 2012). Seeds of Change : Planting a Path to Peace by Jen Cullerton Johnson and illustrated by Sonia Lynn Sadler. (Lee & Low Books, 2010). One Hen: How One Small Loan Made a Big Difference written by Katie Smith Milway and illustrated by Eugenie Fernandes (Kids Can Press, 2008). The Master Weaver From Ghana by Gilbert Ahiagble and Louise Meyer with photographs by Nester Hernandez (Open Hand Publisher, 1998). The Butter Man written by Elizabeth and Ali Alalou. illustrated Julie Klear Essakalli ( Charlesbridge Publishing, 2008). Gugu’s House, written and illustrated by Catherine Stock (Clarion Books 2001).